LAWIG = Look at what I got. Let's have some fun with a set I scored last week off of Craigslist. Every so often, like all the rest of you, I'll jump on Craigslist for baseball cards. 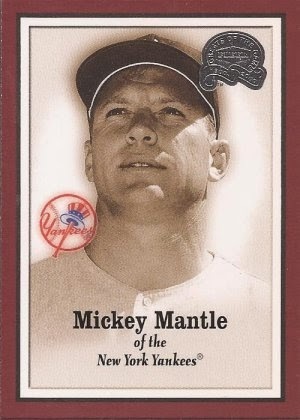 Someone right up the road from me was selling a hand collated base set of the beautiful Fleer Greats of the Game set. 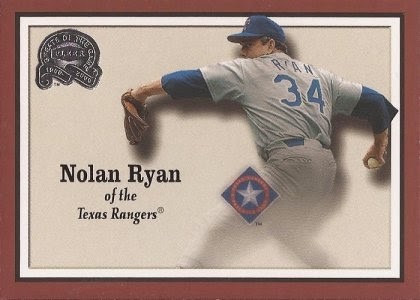 I've been trying to build this via dime boxes for over a year, and only had about 3 dozen of the 107 cards in the set (nice prime number, Fleer). So to find this set for $10 - only a fool would pass that up. Hard to find a better backstop in the game than Bench. No brainer. Strikeout leader, no-hitters. 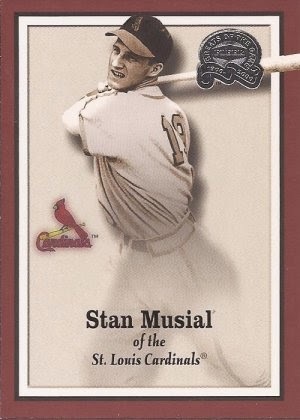 Card #1 in the set, prior to Topps exclusive license on his name and image. His skills on the field, along with the greatest of him off the field. This was a tough pick. 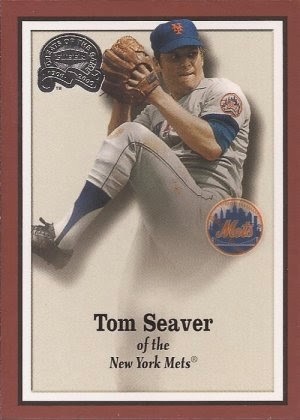 It was between Feller and Seaver in the top 5, but decided on Tom Terrific based on his wins and ERA. Phil was an All Star just 3 times in his career. Lifetime .260 hitter over 16 years with 7 teams. Need a better 2B in the set? How about Roberto Alomar, HOF with 90% on his second year on the ballot. Phil appeared on one ballot, 1994, and received 2 votes. You saying he was a current player at the time? Ok - Let's pick from Rogers Hornsby, Eddie Collins, Nap Lajoie and Jackie Robinson. Herb Score? 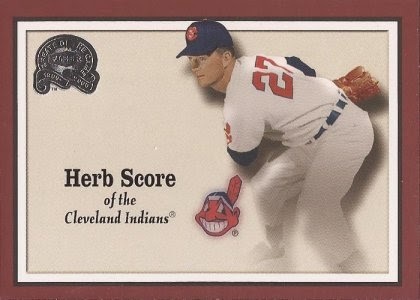 Did we need a certain number of Cleveland ballplayers in the set? Eight year career with a 55-46 record. Sure, he won the rookie of the year in 1955, but after his '55 and '56 seasons, he was done. Not sure I could find you another decent Cleveland pitcher, but how about two lefties that could have been in the set - Sandy Koufax or Billy Pierce. Two more? Lefty Grove and Carl Hubbell. I am guessing the lack of a license for Gehrig is the only reason this Yankee first baseman is in the set. 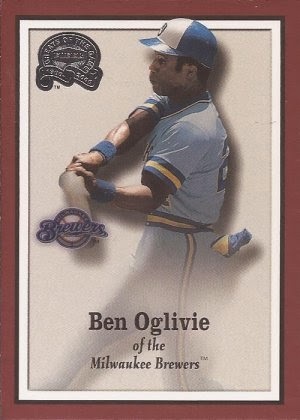 Three time All-Star and 3 Gold Gloves don't really sell him into a card when you have other far better first basemen. Off the top of my head, how about Harmon Killebrew? A total of 13 All-Star appearances and a HOF induction in his fourth vote in 1984. 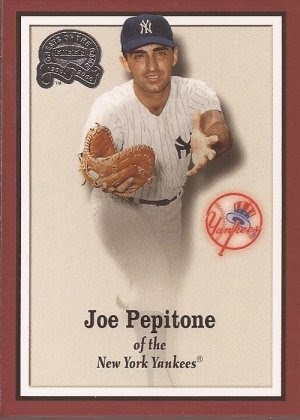 Pepitone? Zero votes in his only year on the ballot. Who? 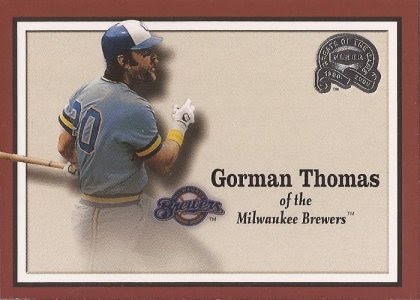 Who in the hell is Gorman Thomas? I honestly never heard of this guy, and his uniform screams 70's, so you would think I would since the Brewers were an AL team at the time. One All-Star appearance in 1981, plus two top 10 MVP vote getter finishes. Otherwise, he lead the league in dingers twice. Sorry, Stormin' Gorman, we should have had a different outfielder represented, say Willy Mays, Roberto Clemente, Ted Williams, Frank Robinson..... should I continue? Great set? Yes. Greats of the Game? Well..... almost. Campanella, Schmidt, Feller, Berra and Brooks Robinson would be a strong second five. Oglivie is the only name I didn't recognize by name. Although I don't know much about Tommy Henrich, Hal McRae (other than he managed), Al Lopez, Clete Boyer, or Preacher Roe. I suppose I need to do my homework. Pretty nice find for ten bucks! Great pickup. One of the most well done sets ever, imo. My only real gripe was that they used contemporary logos with classic photos. 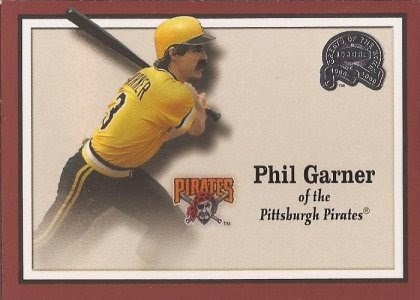 The Jolly Roger logo on that Garner card is just so painfully out of place. Yeah, Thomas and Oglivie might not be all-time greats. 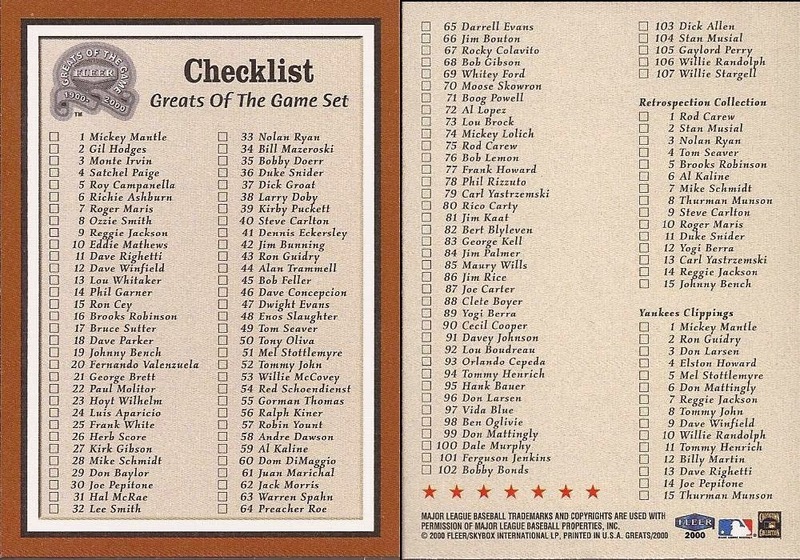 At least this set wasn't 20 Yankees, 14 Mets, 16 Red Sox, and 1 each from the other teams. 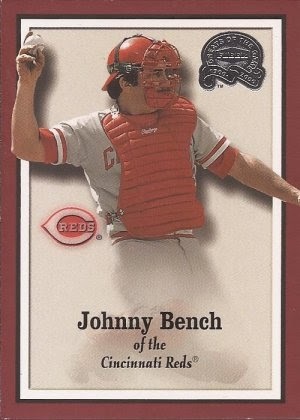 Yes, I'm looking at you Topps, with all your sets including the Yankees' backup catcher this year. One of my personal favorite all-retired sets ever. I'd be all over that for $10. Never noticed that guys like Ruth, DiMaggio, etc. were excluded before this post. Then again, I like the fact that Fleer chose to feature more fan favorite-type players like Garner and Pepitone. Probably not "Greats", but guys that deserve to be recognized nonetheless.